Many young people seek to study abroad, learn foreign languages and attend summer language schools. The idea of going to a foreign country, making friends with people from other countries and being immersed in another culture is an appealing and thrilling one, especially for young people. With this in mind, we thought it would be interesting to conduct a study examining the online search habits of students from six European countries: Germany, France, Spain, the Netherlands, Italy and Poland. These raw insights can help marketers understand the intentions, desires and concerns of students from these different countries, enabling them to refine their marketing messages and targeting. We decided to look at the search terms “study abroad”, “foreign language studies” and “summer language school” in the six target languages. We were specifically interested in students wanting to study abroad, so we decided to focus our investigation on language schools and summer schools only, rather than university language degrees which might take place solely within their own country. 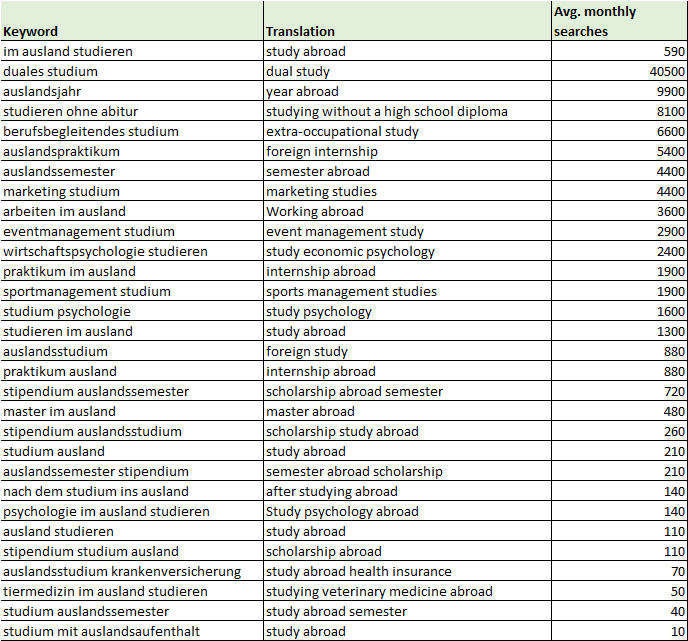 For the keyword research based on the German keyword for “study abroad”, relevant keywords are highlighted in green. The term “scholarship” comes up four times in the results, suggesting that German students are keen to take advantage of the savings offered by scholarships if they are available. 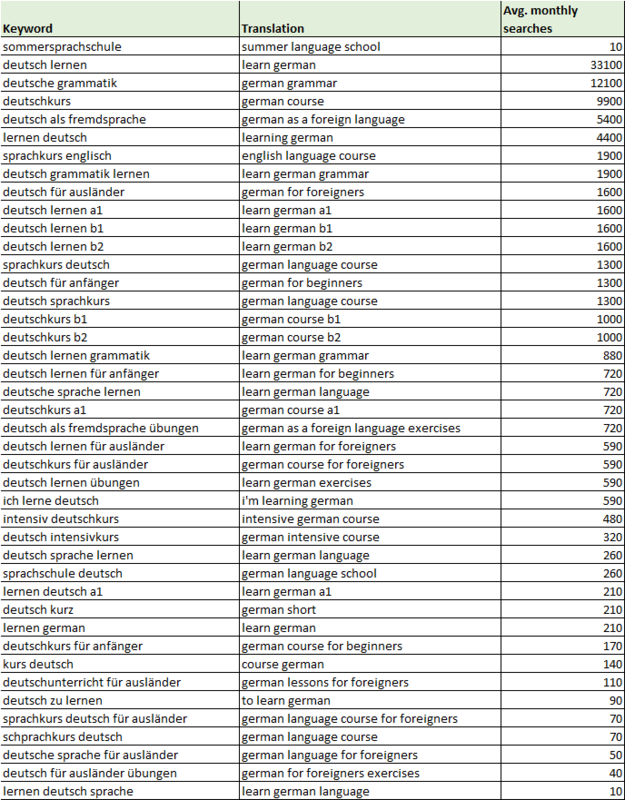 For the keyword research based on the German keyword for “summer language school”, the vast majority of the results focused on courses to learn German as a second language. The majority of the search terms refer to German “for beginners” and “for foreigners”, suggesting that the searches are by immigrants who are keen to improve their German language skills. Only one result in the top 50 refers to a non-German language, with that language being English. None of the keywords referred to “summer”, suggesting that language schools taking place specifically in summer are not popular in Germany. 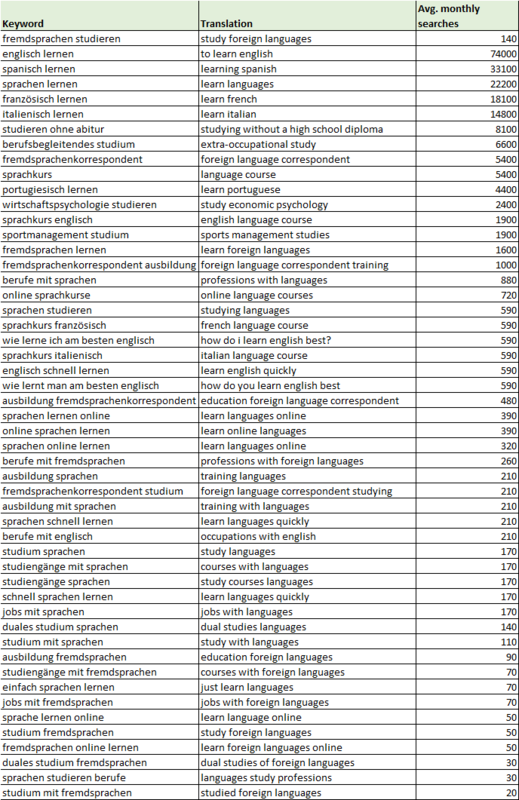 For the keyword research based on the German keyword for “foreign language studies”, we see 12 search terms which specify a language. Of these, English is the most popular language (six search terms), followed by French and Italian (two search terms each), and Spanish and Portuguese (one search term each). The results do not shed any insights into preferred locations to study. Looking at seasonality for all three keywords, we can see that the highest number of searches take place in January. Marketers targeting German students wanting to study abroad would therefore be wise to have all their marketing materials ready and online by this time. Consider offering scholarships, if appropriate. Bear in mind that summer schools are not a popular option for German students. English is the most popular language to learn. French, Italian, Spanish and Portuguese also have a level of interest. Make sure you are ready for the peak in searches in January. 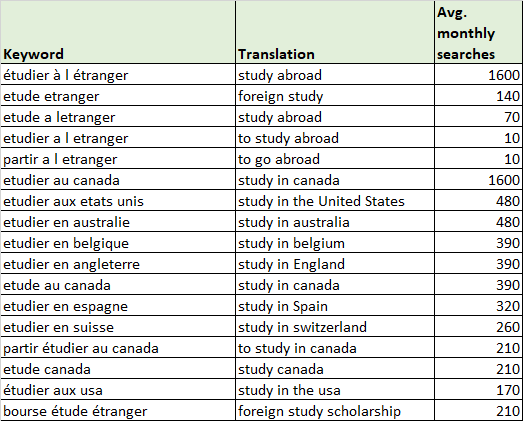 For the keyword research based on the French keyword for “study abroad”, the majority of the search terms are for specific countries. Canada appears more frequently than any other country (four search terms), followed by the US (two search terms), and Australia, Belgium, England, Spain and Switzerland (one search term each). 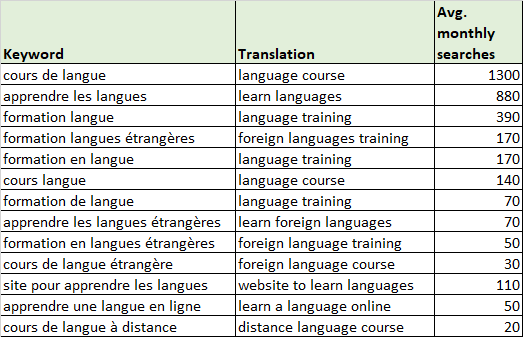 One explanation for the popularity of Canada as a preferred location to study abroad is the fact that French is an official language in Canada, with Quebec being a hotbed of French-speakers. 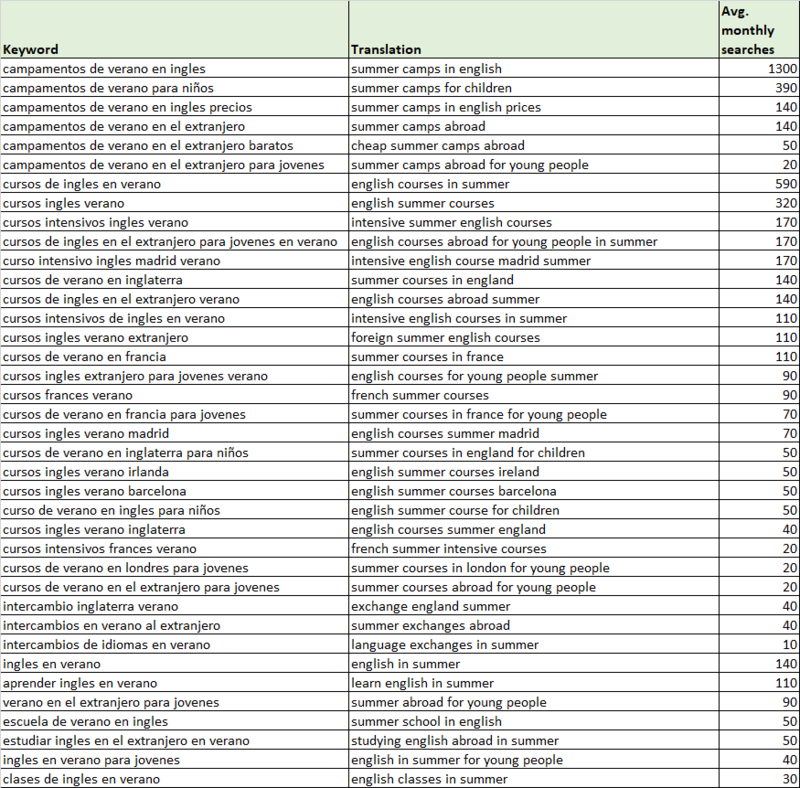 For the keyword research based on the French keyword for “summer language school”, there were very few results. We therefore decided to look at two alternative phrases, “summer language camps” and “language camp”, as these are synonyms and might have a higher search volume. For the keyword “summer language camps”, we found that most of the results specified English as the language to be learnt. 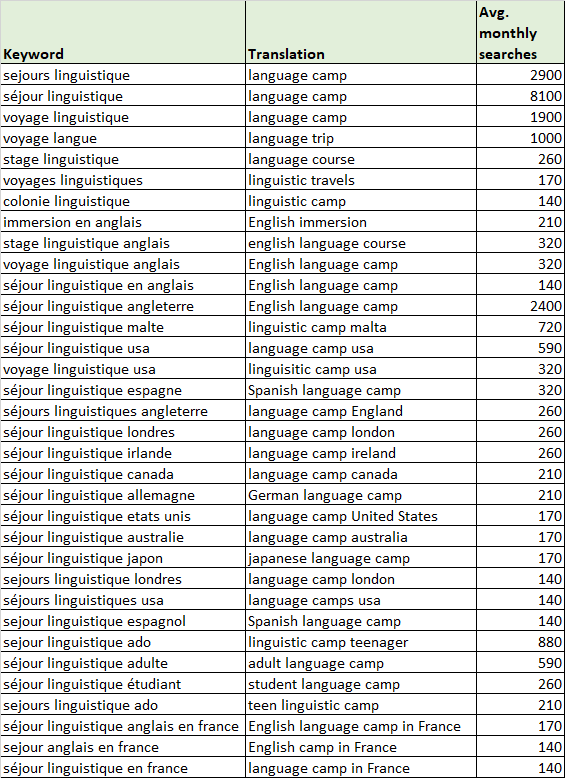 For the keyword “language camp”, we found that many of the searches related to the preferred location for the summer camp. The US and the UK were the most popular locations specified, and English was the most popular language specified. 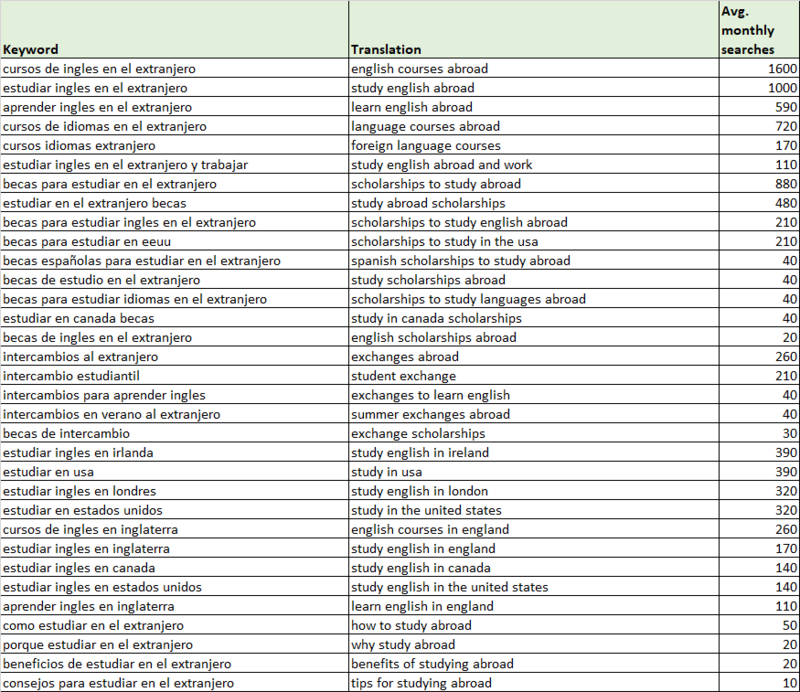 For the keyword research based on the French keyword for “foreign language studies”, there were mainly very generic results. We therefore decided to look at the alternative phrase “learn a foreign language” in case this had a higher search volume. We found that this brought up lots of results specifying particular languages. Looking at the data, we can see that English is the most popular language to learn (16 search terms), followed by Spanish (five search terms), and German, Russian and Chinese (one search term each). It is noteworthy that there are quite a lot of terms related to online/app/quick ways to learn a language. Looking at seasonality, we can see some interesting trends. For the keyword “study abroad” there is a slight peak in January, possibly due to New Year’s resolutions or the upcoming 2-week academic break in February. For the keyword “summer language camps”, we can see the highest number of searches in summer, particularly June. This is when students are searching for summer language schools for July and August. For the keyword “language camp”, we see two peaks: one in January (possibly due to New Year’s resolutions or the upcoming 2-week academic break in February) and then again in the spring (possibly due to the upcoming 2-week Easter break). For the keyword “learn a foreign language”, there are peaks in January and September, possibly due to New Year’s resolutions and the beginning of the academic year respectively. Canada is the preferred location to study abroad, followed by the US, Australia, Belgium, England, Spain and Switzerland. English is the most popular language to learn by a large margin. Spanish also has a significant level of interest. Summer language schools seem to be popular with French students. Be aware of seasonality in search volumes. For the keyword research based on the Spanish keyword for “study abroad”, there are five main types of search terms. The first are general terms to do with language learning. English was the most popular language, with no other languages being specified. The second are search terms to do with scholarships. There are a lot of search terms in this category, suggesting that scholarships are particularly important to Spanish students. The third are search terms relating to specific countries. Of these countries, the US and UK are the most popular locations to study (four search terms each), followed by Canada (two search terms) and Ireland (one search term). The fourth type of search terms are those relating to language exchanges. This seems to be a popular option for Spanish students. And finally, the fifth type of search terms are those seeking advice about language learning. Spanish students seem to consider it important to conduct proper research before deciding to commit to enrolling on a course, as searches for tips or the benefits of studying abroad come up quite often. For the keyword research based on the Spanish keyword for “summer language school”, there was not any search volume. We therefore looked at the close variant “language school in summer”. 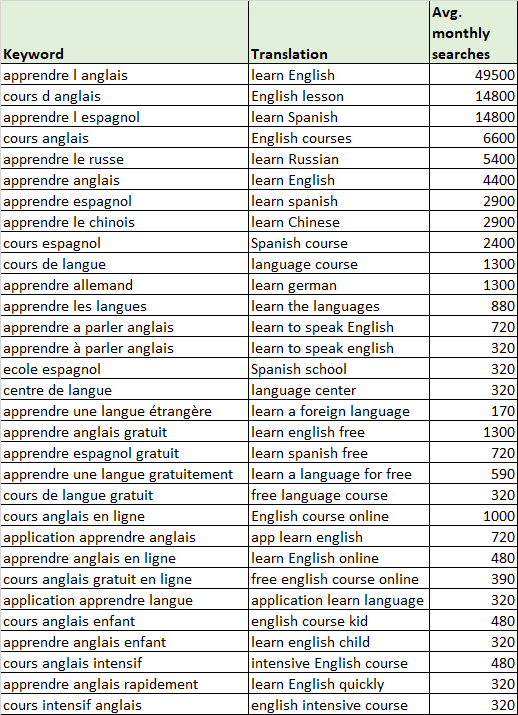 This keyword showed that Spanish students do want to learn English in the summer, but instead of searching for “schools”, they search for “courses” and “camps”. The most popular language to learn is English, with French also picking up a handful of searches. With regards to the preferred location, many people just search for “abroad”, with the UK, Spain and France being named as specific locations. Many of the searches refer to “young people” and “children”, suggesting that language learning is most popular within this age group. 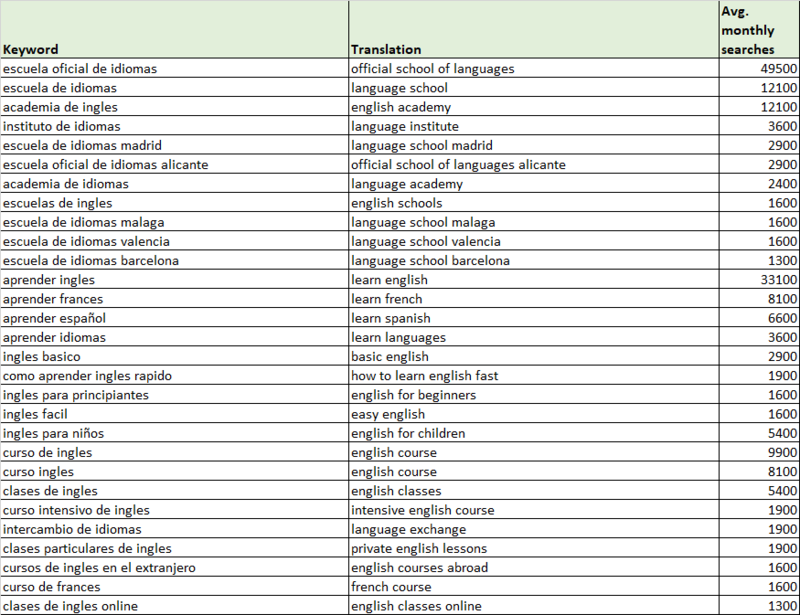 For the keyword research based on the Spanish keyword for “foreign language studies”, we found a mixture of specific languages and language schools. English was by the far the most popular language to learn (15 search terms), followed by French (two search terms) and Spanish (one search term). Searches for particular language schools were also very popular, especially official language schools in Spain – with a focus on Andalusia, Valencia and Alicante. This suggests that Spanish students are interested in getting a language certificate from an official institution. Looking at seasonality, we can see that searches for “study abroad” peak in January, February and September. Searches for “foreign language studies” peak in June. English was the most popular language to study by a significant margin. French came in at a distant second place. A variety of preferred locations to study were revealed: US, UK, Canada, Ireland, France and Spain. For students looking to study in Spain, they tend to focus on official language schools, suggesting they are keen to get a language certificate from an official institution. Language exchanges and summer schools are the most popular methods of language learning. Young people and children are the dominant age group interested in learning a language. Consider posting advice/general content on your blog, as Spanish students are keen to conduct research before making a decision. We could not find any seasonality information for “summer language school”. Therefore the seasonality graph below is for “summer language courses”. 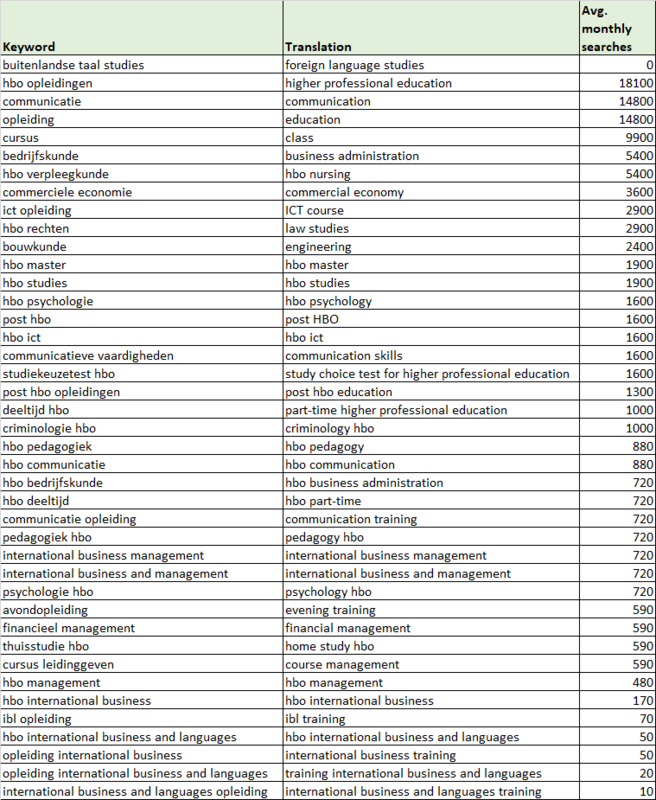 For the keyword research based on the Dutch keyword for “study abroad”, we found that there were a lot of search terms to do with internships. Generally speaking, Dutch students will do their Bachelor’s degree in the Netherlands, before venturing abroad. Usually, in their third or second year at university, they will look for opportunities to do an exchange, or an internship, or even a Master’s degree once they have finished their Bachelor’s. Internships abroad are especially popular as they are a way to get experience (which looks good to potential future employers) and offers them a chance to travel. Out of the search terms, there was only one result that specified a preferred location, with that location being “England”. 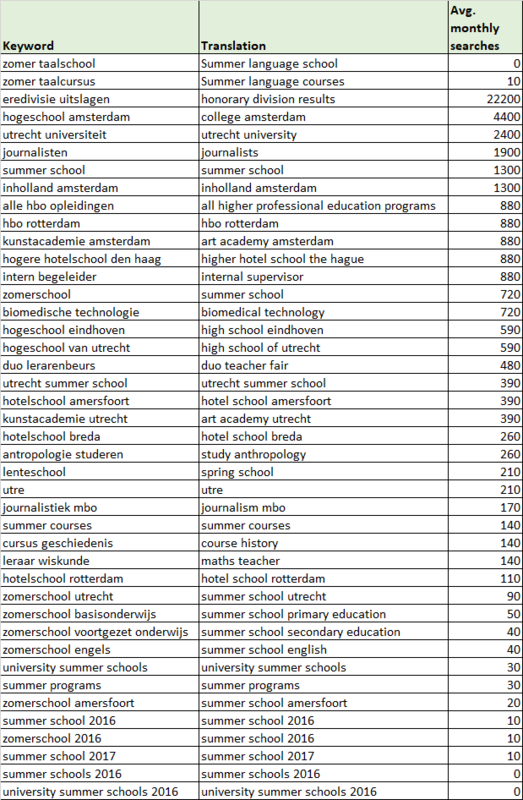 For the keyword research based on the Dutch keyword for “summer language school”, we found that the vast majority of the search terms were to do with non-language subjects such as art, history and maths, rather than languages. This is because Dutch people tend to generally be very good English speakers. They learn English from a young age through school and the constant stream of American and British popular culture. In high school, learning a second foreign language is encouraged as well, usually French and German. Many high schools these days have expanded their options to Spanish, Russian, Turkish and even Mandarin. As such, Dutch people tend not to look specifically for “language schools”. Summer school is usually a university-level “summer course” that interested people can follow to supplement their current studies. 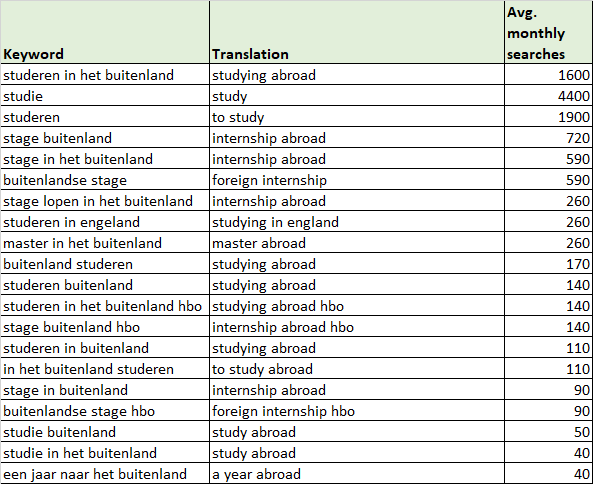 For the keyword research based on the Dutch keyword for “foreign language studies”, we found that none of the search terms referred to a particular language or location. This is because the keyword “foreign language studies” is probably too general. There are university-level courses that include a foreign language, but it wouldn’t be just about the language. For example, the University of Leiden offers Korean Studies, in which the learning of the language is a module, but the course also covers the history and culture of the country and usually includes a semester or year abroad. Business management came up repeatedly in the search terms. This is a popular course among Dutch students because these courses are known to offer opportunities for internships or exchanges to a foreign country. Looking at seasonality, we found a big peak for “summer language courses” in May. This is because that is usually when the semester ends and people look for options over the summer. No preferred locations were revealed through the keyword research. Language courses are not popular in the Netherlands as most Dutch people have such a high standard of English from school. Therefore, when Dutch students seek to go to summer school, they tend to look for non-language subjects. The preferred method of studying abroad is internships. 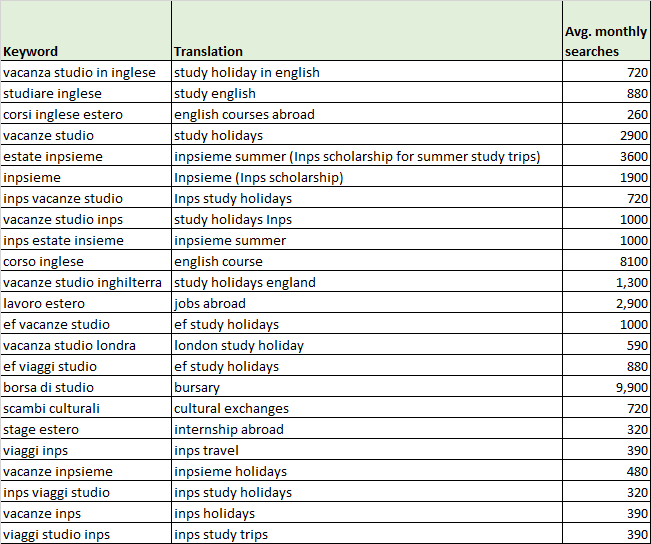 For the keyword research based on the Italian keyword for “study abroad”, we can see that English is the only language that appears in the results, suggesting that English is the preferred language that Italian students seek to study. The results also show that England is the preferred location for study, specifically London. The preferred method of study seems to be study holidays (where students study the language in the country and get to experience the local culture at the same time), and the favourite season seems to be summer. Government scholarships and bursaries are a popular search, therefore we might infer that costs are a concern. Providers of study holiday programmes are popular searches (there are two search terms mentioning the provider EF). 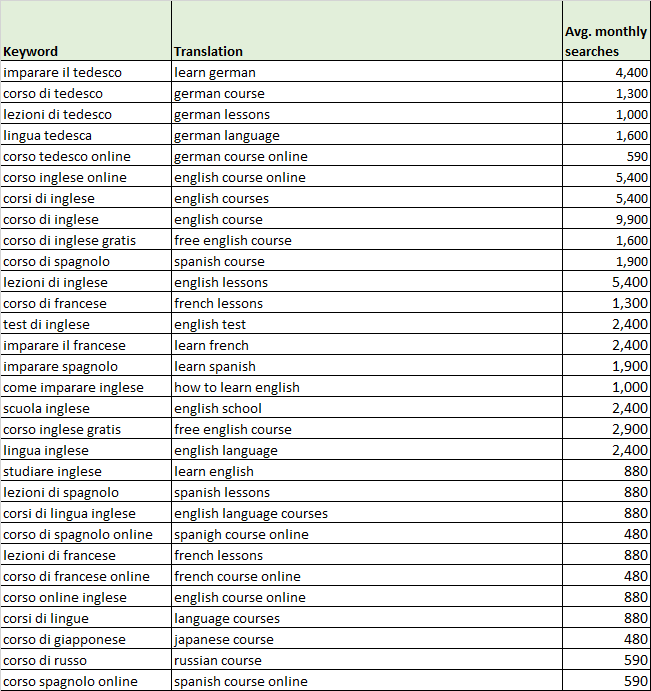 For the keyword research based on the Italian keyword for “summer language school”, we can see that the most popular languages are English (13 search terms), followed by German and Spanish (five search terms each), French (four search terms), and Japanese and Russian (one search term each). Free and online courses are particularly popular. 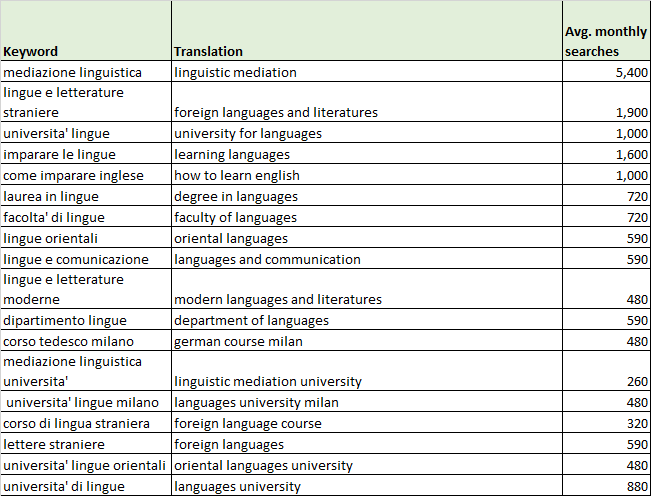 For the keyword research based on the Italian keyword for “foreign language studies”, all results were about university courses. Modern foreign languages seem to be the most popular. Literature and cultural communication are also frequent searches. Looking at seasonality, the keyword “study abroad” peaks strongly in February and March. The keyword “foreign language studies” peaks slightly in September and October, the start of the academic year. The keyword “summer language school” peaks in September, October and January. English is the most popular language to study by a significant margin. The UK seems to be the preferred location to study abroad. The preferred method of study seems to be study holidays, where students study the language in the country and get to experience the local culture at the same time. 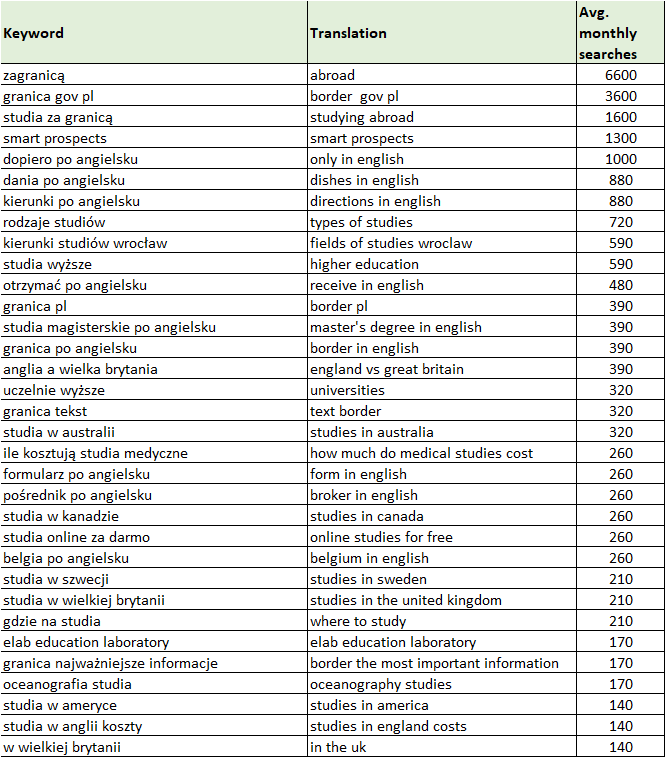 For the keyword research based on the Polish keyword for “study abroad”, there were a lot of irrelevant search terms. From the few relevant keywords, we can see that the most popular language to learn is English. Several preferred locations to study come up in the results, including the UK, the US, Canada, Australia and Sweden. 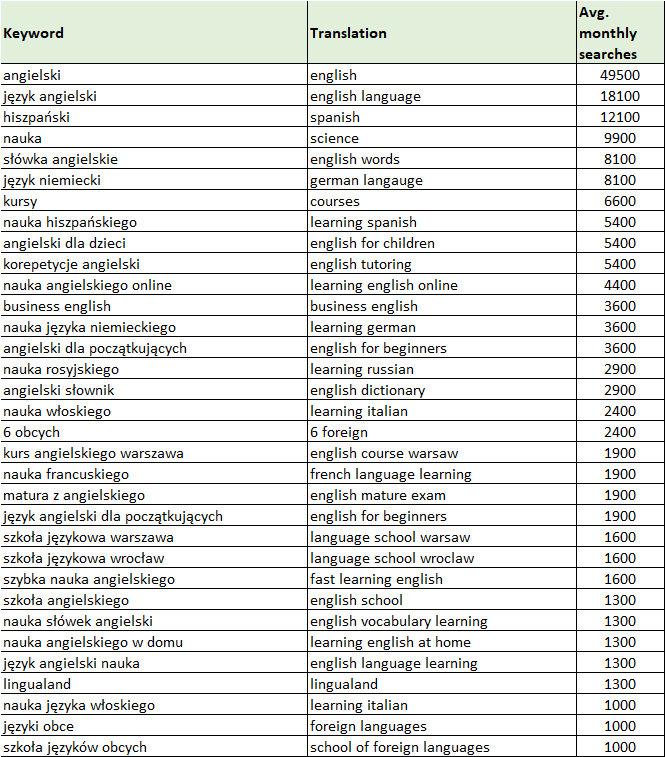 For the keyword research based on the Polish keyword for “summer language school”, we can see that Polish students are interested in learning a variety of languages. The most popular language to learn is English (17 search terms), followed by Spanish, German and Italian (two search terms each), and Russian and French (one search term each). However, the results did not show any searches for actual schools. 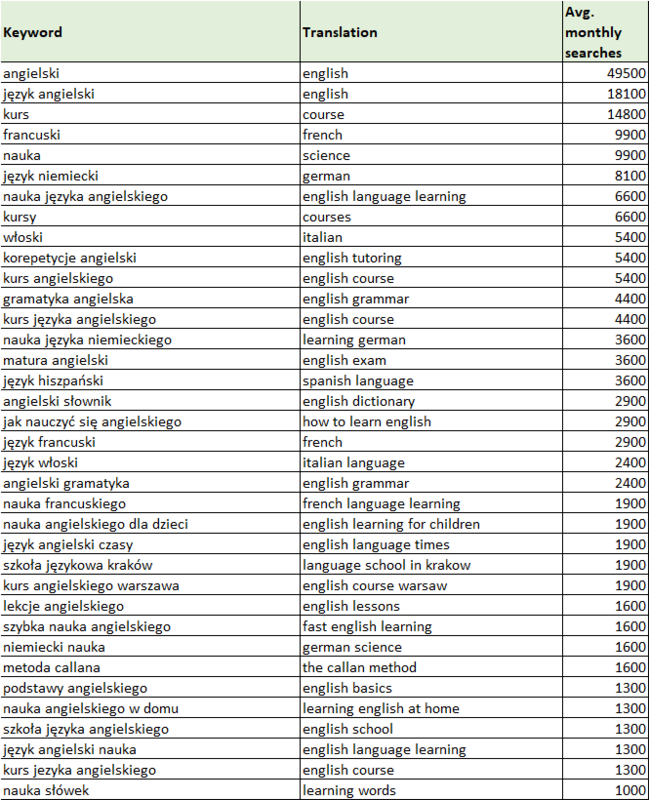 For the keyword research based on the Polish keyword for “foreign language studies”, we encountered very similar results as for the previous keyword. Once again, English was the most popular language (21 search terms), followed by French (three search terms), German and Italian (two search terms each), and Spanish (one search term). Again, there were no searches for particular institutions. Looking at seasonality, we can see that the keywords “study abroad” and “foreign language studies” both peak in January. This could be due to New Year’s resolutions. The UK, the US, Canada, Australia and Sweden were revealed as preferred locations to study abroad. English was the most popular language to learn, by a significant margin. No preferred method of learning was revealed by the keyword research. I hope this has study has been an interesting and insightful look into the motivations and desires of European students wanting to study abroad. Do you have any insights or thoughts to add? Leave a comment below! And if you want to read even more in-depth content about digital marketing in the education sector, take a look at our education-focused guides on our Know-How platform.